Posted August 29, 2018 by Lanie Tindale & filed under Featured Inner West Independent, Inner West Independent. We all know the current drought affecting Australia has hit farmers hard, and with no relief in sight (the Bureau of Meteorology forecasts a Spring likely to be warmer and drier than normal) Australians across the nation are stepping up to help the nation’s farmers battle through. Organisations and individuals are pitching in and donating money, groceries and bales of hay, but to be effective this support effort needs to be ongoing. Bringing aid to the hardworking farming community is no easy task, as those affected by the drought are spread throughout the country. Locally, furniture company Annandale Interiors are playing their part by donating a beautiful item of furniture to be auctioned by Australian charity Aussie Helpers. Aussie Helpers is a charity supporting hundreds of farming families, ensuring their wellbeing and survival through good and bad times. The money raised from auctioning the chair, inspired by the Australian country lifestyle, will support farmers in Dubbo, NSW. Aussie Helpers founder Brian Egan announced last week that the charity will also be giving $2 million dollars in prepaid Visa cards to 500 farming families struggling to survive the worst drought in memory. Mr Egan said the stricken families will be given $4,000 each to help pay for living costs. Many of his volunteers had been hearing from farming families living in third world conditions, with no income and unable to pay their utility bills or register their vehicles. The eye-catching and uniquely designed Annandale Interiors chair will be auctioned at a charity gala dinner at the iconic Le Montage on the waterfront in Lilyfield on 21st September, along with other items donated by local businesses. Farmers from struggling country towns will be in attendance and will share their stories, along with prominent local figures who are supporting the event. Tickets to the dinner can be purchased through Annandale Interiors. 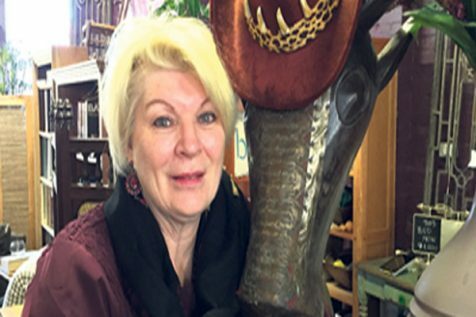 Owner Kim Thompson has been supplying Inner West households with modern classic furniture and homewares for over 30 years, and she was determined to do her part for the drought-stricken community. “The drought is not going away, and we need to support our fellow Australians in the country in any way we can,” she said. Ms Thompson herself has lived in country NSW and has regular long-standing clients from as far away as Wagga Wagga and Orange. “When you help people choose the pieces of furniture that will live in their homes for years, you become involved not just in the design of their homes but in their lives as a whole,” she said. A family business, Annandale Interiors specializes in individual, unique and bespoke furniture and interior design, with pieces featuring textiles, leather and timber materials. Many of their items such as maps, war memorabilia, saddles and leather and timber furniture are Australian designed with a classic homestead feel. Furniture for the living room, dining room, home office, balcony and outside spaces showcase the Australian lifestyle, with hints of the French Riviera. Ms Thompson described the company’s vision “We help people achieve their dreams with furniture”. “You can’t underestimate the importance of the design of a space that you live in day in, day out,” she said. If a customer can’t find the furniture they dream of, then Annandale Interiors can solve the problem by custom designing and building their vision just as they imagined it. Annandale Interiors has a history of donating to Indigenous and wildlife charities both local and national, and supporting their customers and the community at large is part of their ethos. Annandale Interiors is at 38-42 Parramatta Road, Stanmore.